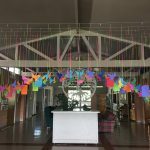 Members of Disciples Christian Church in Bartlesville, OK, display a rainbow of doves to express their Open & Affirming commitment. I was in seminary and had just come out 1990 when the Central Rocky Mountain Region(DOC), at its regional assembly, passed Resolution 9004; a resolution denying Gays and Lesbians standing in the region and region sponsored ordination. I had already told my regional minister and teacher of Disciples History and Polity at Iliff Theological School, that I was a lesbian and was never going back into the closet. His response was never to suggest I become in-care with the region, a licensed theological student, or have any connection with the DOC that might be supportive of me. But I did anyway. I worked at Eastside Christian Church with a pastor who had a gay son, helped begin the Colorado Region of GLAD, spoke out at Regional Assemblies and anywhere else I thought I would be or might be heard. In 1992, the LGBT community was activated to respond to the incredibly conservative attack on our civil rights by repealing local municipality’s rights to pass laws protecting the civil rights of the LGBT community. It was a long hard vicious fight. I was in the middle of educating the LGBT community as to what it meant, speaking at debates, leading protests and candle light vigils for months. When the vote came in November and was narrowly passed, it was like a kick in the gut. In addition, a relationship breakup, and a particularly bad car accident and back injury, and I walked away from my last quarter at Iliff. I just never registered, responded to any mail or returned to the campus. Obviously a major depression evolved over the situational elements, but I was never going to be ordained so why bother trying? My personal redemption came in the form of an invitation to a potluck. A straight ordained woman who had experienced difficulties finding employment in the good old boys system in the metro Denver area knew that there were other people who had found the same problem or similar issues or were dissatisfied for some reason with the local church. Her email brought a large group of us together for mutual support. That potluck led to another and another. One brave woman had faced the committee on the order of ministry and come out as a lesbian and had been stripped of her standing. We were there for her. My new found community was there for me in my aimless anger at God. We were everything the first century church had been without calling ourselves church, even though we met twice a month for support, study, discussion and a common meal. We were later recognized as a formal congregation, a move which prompted several other churches to leave the CRMR, because we were a “Gay” church. Since that time, I have remained an active member of Fireside Christian Church, the small home church, for 18 years, and have worked for 8 years in a DOC congregation as Youth Director and 6 months in an ELCA (Evangelical Lutheran Church in America) congregation as a Volunteer Coordinator. (I had served for 2 years as an associate pastor before I came to seminary.) When the CRMR rewrote their Design and dropped the anti-LGBT language out of it, I struggled with whether to get licensed or not. I had always said, “The people who value my work don’t care about the letters after my name and the people who care about the letters after my name don’t value my work.” But eventually I decided that it was important for Queer folks to be recognized in the leadership of the church. I am also in the “unconventional” (for lack of a better term) ordination track. Perhaps my 3 1/3 years of seminary, 8 years as a youth director, 2 years as an Associate Minister, 18 years with Fireside and 8 years on the Regional Discernment Team will convince them I am serious, equipped and capable. If that doesn’t outweigh the “gay” issue, I will stay a part of Fireside, because they are my chosen family, but I may look into the UCC. I’m 47 years and the DOC’s refusal to even discuss the issue on a General level is ridiculous: we are in your pews, our mothers and fathers, sisters and brothers are in your pews. To me, being a Christian means following Jesus. It is the core of being a Disciple of Christ denominationally. It means radical hospitality as a way of life. I have moved into a racially, ethnically, financially and ability mixed community. We share food when we have it. We share rides when they are needed. (I don’t have a car.) We loan our phones to our friends who need to make a call and don’t have their own. We help a person in a wheelchair reach something that is just too high for them. When someone needs a place to crash, we share a couch. We share vacuums, if as have one. Radical hospitality has created a community here where there typically isn’t one in a large apartment complex. People may perceive this is a “slum” because it is Section 8 primarily, but it just might be where Jesus would live, if Jesus would ever sign a lease. If he wouldn’t, he would be welcome on my couch. I try to see Jesus in everyone I live with, be they addicts, prostitutes, single parents , disabled folk, poor, rich, temporarily able bodied, whatever. I wish I could be licensed to live the ministry I live in my low income housing, instead of being forced to be licensed to serve in a brick and mortar church I can’t get to on the bus line. But that isn’t the way the institutional church works. Christianity works that way though: for me, my faith is not about an afterlife. That is God’s responsibility. My call is to bring about the kingdom of peace and Justice HERE and NOW. It may not be achieved in my lifetime, but that is still my call. The church has no idea what talent and passion it is losing by not dealing with the LGBTQ community. I hope it wakes up to that soon.